Did you enter the justice system because you believed you could make a difference? But something has changed. Your days of idealism are long gone and the job is feeling more like a thankless chore. You begin to ask the bigger question, “Is this all there is?” Burnout is a common phenomenon among those working in the justice system and the consequences can be great. The problem is compounded for those who work in an organization with poor leadership, increasing demands, and fewer rewards. So what can you do? Change is difficult. And as we age, we often sacrifice our own mental and physical health to provide for our family. But sometimes, change is thrust upon us. Budgets get slashed and jobs disappear. 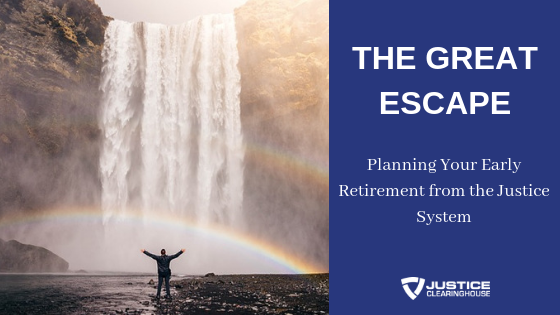 Early “retirement” is tossed our way as a cost-saving measure. And people hit their “breaking point” and quit or end up being fired. Are you prepared for this type of job disruption? Will you fear it or embrace it? Do you want control of your destiny? What if job burnout was really a hidden opportunity to explore other dimensions of your life? Is it possible that you could direct your success and ambition in another direction that will provide a more fulfilling life? Absolutely! This webinar is for everyone in the justice system who is looking for an “out” or who wants to be prepared if their career suddenly ends. We’ll turn our attention the following questions. How would you score on the “vacation test”? Is there a safe way to explore options while continuing on the job? What will be my new purpose? What attitude adjustments might be needed to succeed in the brave new world? Join this engaging webinar to gain a glimpse of the future you can create.